UK hopes in the fiercely-contested EMX250 class took another beating at the MXGP of Lombardia in northern Italy. Heading into the fast sand track at Ottobiano holding second and third in the championship chase, REVO Husqvarna UK team-mates Mel Pocock and Martin Barr both lost ground on series leader Mathys Boisrame (Honda). After taking the championship lead at his home race at St Jean d’Angely last weekend, the Frenchman extended his advantage over Pocock by six points to 19 and opened up a 32-point gap on Barr following two action-packed races. It was Holland’s Roan Van De Moosdijk (Yamaha) who claimed the overall with a three-three scorecard after British-born Kiwi Dylan Walsh (Husqvarna), who won Saturday’s opening moto, faded in the intense heat in the closing stages of today’s second race. But the biggest story to come out of this weekend’s EMX250 contest was the first major race win for Aussie Jett Lawrence (Suzuki). Just 14 years old, he chased down former world 85cc champion Steven Clarke (Carglass Honda) in race two, moved into the lead on lap four and displaying a maturity that belies his age motored clear to beat the experienced Brit by almost seven seconds. The result, coupled with his 10th-placed finish yesterday, was good enough for third on the podium behind Van De Moosdijk and Walsh. Walsh holeshot Saturday’s 25-minute plus two lap race with Boisrame on his rear wheel and France’s Brian Moreau (Kawasaki) in third. Barr held an initial 10th with James Dunn (GL12 Racing KTM) 14th, Pocock 18th, Todd Kellett (Verde Substance KTM) 20th, Josh Spinks (M Smith KTM) 23rd and Clarke all the way back in 28th. Moreau slipped back down the field to eighth and once Van De Moosdijk had moved into third on lap four the top three was decided. 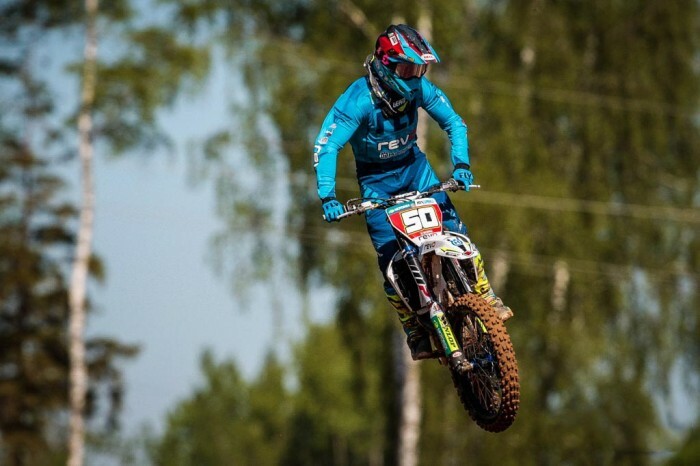 Norway’s Kevin Horgmo (KTM) took fourth from Maxime Renaux (Yamaha) with Barr advancing to sixth at the flag. Pocock fought his way up to ninth with Kellett 13th, Spinks 14th and Clarke 15th but Dunn, on the only two-stroke in the field, finished out of the points in 25th. Clarke holeshot race two before being passed by Lawrence – whose older brother Hunter races in the MX2 class – with the young Aussie quickly checking out. Van De Moosdijk came through to third from 15th after the opening lap but with three to go it was Walsh who was looking good for the overall in fifth behind Moreau before Pocock and then Latvia’s Karlis Sabulis (Yamaha) passed him. Spinks was a solid 10th with Barr, all the way back in 38th on the opening lap, limiting the points damage in 12th. Kellett was 20th but Dunn again failed to score in 22nd. Boisrame had been running in seventh but went down after contact with Pocock and at the flag was ninth. Lombardia also saw round four of the MXW series for women where Holland’s Nancy Van De Ven (Yamaha) ran out winner on a tie-break with a three-one scorecard from home favourite Kiara Fontanesi (Yamaha) who went one-three. Series leader Courtney Duncan (Yamaha) from New Zealand ran two-two for third overall and with two rounds to go leads defending champion Fontanesi by 21 points. Irish racer Natalie Kane was seventh overall and holds sixth in the championship.